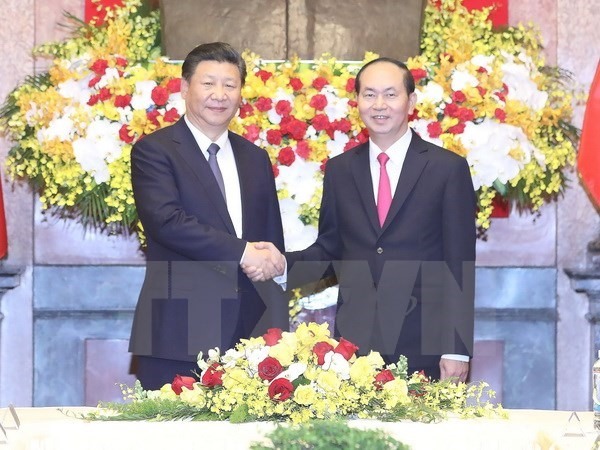 HÀ NỘI – President Trần Đại Quang yesterday called for unceasing reinforcement of political trust between Việt Nam and China. In talks with General Secretary of the Communist Party of China (CPC) and State President Xi Jinping in Hà Nội yesterday, he said Xi’s choice of Việt Nam as the first country to visit after the CPC’s 19th National Congress was an illustration of respect for Việt Nam-China relations and support for the APEC 2017 Economic Leaders’ Meeting hosted by Việt Nam. He thanked China for providing non-refundable aid packages and urgent relief for people in some Vietnamese localities hit by recent natural disasters. Việt Nam and China are neighbouring countries that share many similarities in development directions, political regime, and cultural and social features, he said, adding that the development, stability and achievement of either country was important for the other. The enhancement of healthy and stable development of bilateral friendship and comprehensive co-operation is in line with basic and long-term interests of the two countries and peoples, promoting peace, stability and development in the region and the world, he said. Việt Nam’s foreign policy accords top priority to the development of a comprehensive strategic co-operative partnership with China and is the nation’s consistent and long-term policy, President Quang emphasised. He called for unceasing consolidation of political trust between the two Parties and countries through continued high-level visits and meetings. The two sides need to direct sectors and authorities at all levels to effectively carry out agreements and strengthen common perceptions, he said. They should also take concrete actions to bolster mutual trust, understanding and connectivity between the two peoples, such as people’s forums and youth festivals. They should direct press agencies to further communications on the countries’ friendship, he said. President Quang also called for the expansion and intensification of bilateral co-operation, particularly in important spheres including diplomacy, defence, security and law enforcement. Việt Nam and China should target more effective co-operation in economy, trade, investment, agriculture, environment and science-technology, he said. He also said the implementation of China’s major projects in Việt Nam, using advanced and environmentally friendly technology, should be speeded up. The two sides need to address some problems in their co-operation so as to create economic trust and consolidate the material foundation for bilateral ties, he said. On the East Sea issue, the President asked both sides to abide by agreements and common perceptions identified by the two countries’ leaders, including the Việt Nam -China Agreement on Basic Principles guiding the Settlement of Sea-related Issues, and actively step up practical negotiations on issues at sea. While disputes are yet to be settled, the two countries should exercise self-restraint and refrain from actions that further complicate the situation, he said, adding that Việt Nam welcomes positive progress in ASEAN-China negotiations and adoption of the framework for the Code of Conduct in the East Sea (COC). He requested that China and ASEAN continue to fully and seriously implement the Declaration on the Conduct of Parties in the East Sea (DOC) and conduct practical negotiations to build an effective and efficient COC. Xi, for his part, congratulated Việt Nam on successfully hosting the 2017 Asia-Pacific Economic Co-operation (APEC) Leaders’ Meeting. He said he wished to continue working closely with Việt Nam to increase high-level meetings to share experience in Party building and national development, uphold the coordinating role of the Steering Committee on Việt Nam -China Bilateral Co-operation, connect the “Belt and Road” initiative with the “Two Corridors, One Economic Belt” framework, build cross-border economic areas and launch key projects. China will take measures to facilitate Vietnamese farm produces access to China towards achieving a balanced and sustainable development in bilateral trade, he said. Xi also said that China will consolidate social ties via increased friendship exchanges between the two peoples, enhanced press co-operation and implementation of projects using non-refundable aid from China. At the same time, China will pay due attention to managing disputes, and maintain peace and stability at sea while increasing exchanges and sharing experiences to deal with challenges, he said. Following the talks, the Vietnamese President hosted a banquet in honour of the Chinese leader and his entourage.